We’d love your help. 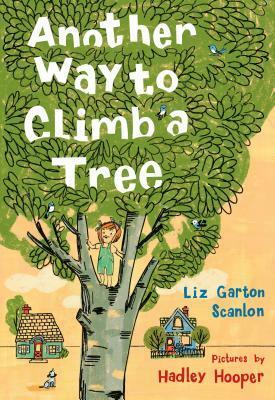 Let us know what’s wrong with this preview of Another Way to Climb a Tree by Liz Garton Scanlon. To ask other readers questions about Another Way to Climb a Tree, please sign up. A cute story about a girl who has a thing for climbing trees! Lovely language and color palette. I'm going to be honest, at the line "Lulu grows pale and quiet," I got real worried that this book was about to take a dark twist. This one didn't do much for me. OK but not much more than that. Illustrations were nice. Somehow the whole package was just OK.
Who gets chicken pox or measles anymore anyway?? 3 1/2 stars. Lulu loves to climb trees, but when an illness keeps her inside she finds a way to keep herself in tree climbing shape. Handsome illustrations make this a fine book especially good for a sick child. Girl becomes one with a tree in this story that could work for Earth Day, Arbor Day or anytime you want to celebrate the joy of trees. Fabulous illustrations! I love the illustrations, color palette, and paper texture of this book. It shares a fun and imaginative story about climbing trees. Although most readers (and reviewers) may interpret the end of the book as Lulu using her imagination to climb the trees, I interpreted it as being more metaphorical; as if Lulu died at the end as the narration says, "She's here and then she's gone, just like that." More of a somber tone for kids who may struggle with chronic illness. Gorgeous illustrations of the great outdoors and TREES! And it's a delightful story of Lulu the tree-climbing girl who climbs all trees, even those that other kids fall out of! She is a whiz, except when she gets sick, and then the trees miss her and she misses the trees. There is one way she finds that connects that title to the story, even when sick! This will make a great read-aloud for young readers. Basically about a badass kid who rocks tree climbing, and feels super connected to nature. She gets sick though (nothing serious, I think? It's not a heavy book about illness or anything) and can't go outside so she retreats to her imagination looking at a tree shadow on the wall. She's also a redhead, which I love since my own kids are redheads. What a gorgeous book! I love the simplicity of Scanlon's words, how they evoke not only Lulu's personality, but an appreciation of the natural world. The illustrations are striking, color-wise, and also convey exactly what the words seem to convey. One of Liz Garton Scanlon's best books, and that's saying a lot. Lulu loves to climb trees, the sappier the better. She even climbs the trees other kids fall out of! And then she just disappears. When Lulu got sick she couldn't play outside in the trees but she finds another way to climb them anyway! The illustrations in this book make you want to go out and climb a tree yourself. For ages 3 - 7. Lulu loves to climb trees. There is not a tree around that she can't climb. She feels a special closeness to the trees. But when she is sick and can't climb a tree, she wonders if the trees miss her. Maybe the birds do, too. She longs to climb a tree, even while she is stuck indoors. But, how can she do that? Spoiler alert: She figures out a way! Lulu climbs trees. All the trees. Even those no one else will climb. But when she gets sick and has to stay inside, she misses her trees. She watches the sun climb the trees. Then the moon. Then she finds a tree shadow on her wall. So she climbs on her bed and reaches the tallest branches on the tree and disappears in its shadows. This review has been hidden because it contains spoilers. To view it, click here. I'm in love with this book! Lyrical, tree and child focused, friendship and nature themed...Lulu is the best climber and loves her trees. But when illness strikes, Lulu gets depressed. And then creative. Sometimes life gets in the way of doing what we love or what we want to do.... but this book encourages readers to use their imagination, and with that, the sky is the limit to continuing chasing dreams. Lulu like to climb trees. When she can't play outside because of illness she pretends to climb the shadow the tree makes on her wall. Readers may be impressed by Lulu's imagination, but will be skeptical that enjoying a shadow can substitute adequately for an actual outdoor experience. When a young girl is too sick to go out and play on her favorite tree, she invents a new way to climb the tree – in her mind, in her room. This book was cute. I loved tree climbing when I was a kid. Kids aren't doing that as much. This story shows the joy one child finds in climbing trees and what happens when she is ill and cannot go out and climb them. I love her spirit and the trees in this story. A little girl loves to climb trees...all kinds of trees, and trees that no one else will climb. Until one day, when she gets sick and can't climb. But her imagination kicks in and she comes up with a new way to climb. Cute book about a little girl who loves to climb all kinds of trees. Then one day she gets sick and the trees and birds miss her. Then she realizes she can climb the shadows of the tree on her wall. It's a different kind of way to climb. This is a good picture book for kids who love climbing trees. It may also cheer up children who cannot go outside and play (because they are a bit sick) because the heroine finds a way to play her favorite tree climbing activity inside. The text took me back to my childhood days of fearlessly climbing trees, and so did the illustrations. I find them a bit dull and simple, like most books from the 60's. The ending is clever and original. This story is all about adventure and imagination. Climbing a tree is all LuLu wants to do. But what will happen when sh e is not able to climb the tree? Will she find a way to do it even though she is sick and stuck in the house?